It’s kind of funny that I’m working here. At Mario Badescu. Ironic even, if you knew me pre-internship. Fashion enthusiast with an insatiable lust for heels and handbags, and the tiniest bit of a beauty snob, yes – but skincare junkie? Hardly. My skincare regimen (I use the word “regimen” lightly, here) consisted of a generic cleanser and whatever I saw first in the beauty aisle of some ubiquitous drugstore. Clearly I was the picky type. One week into the internship, post-training, I have an impressive lineup of skincare products on display, all chosen and tailored to my skin type. And while they do look so lovely sitting atop my bathroom counter, I actually use them – religiously (!). Cleanse. Tone. Moisturize. Pat on the eye cream. Et cetera. Slather on the body lotion and hand cream. Indulge in a scrub or mask. A couple months ago it was a slap-dash-and-go kind of ordeal, where I hoped for the best (which was useless in any case). My skin was moody, but since being properly pampered, it’s house-trained. Behaved. It enjoys treats – a combination of the Almond Honey Non-Abrasive Scrub and Orange Tonic Mask. If it’s extra good it gets rewarded with a brand new lipstick. The brighter the better, I say. Summer 2011 is, after all, about the oranges and unabashed hot pinks. And why not? Good skin deserves all the attention it gets. Almond & Honey Face Scrub. Looove. Maybe obsessed, but I’m trying not to sound like your cliche intern gushing about a company’s products. The name sounds divine, for one. Almond and honey? A delicious combination. The scent is scrumptious – very natural, none of that artificial fragrance business – decadent but not gourmand. In truth I haven’t paid attention to the results in my skin after its use; I pick it up purely for the scent, go figure. The texture is lovely though. Creamy, with bits of finely ground almonds and cornmeal that gently exfoliate the skin. Even if it was grainy and sandpaper-like you wouldn’t notice – that scent is too good. Herbal Hydrating Serum. I’ve written about this before, so there’s no need to redo and rehash what’s been said and risk sounding like a broken record. Long story short: it’s dewiness in a bottle. And the perfect kick of hydration when my combo/oily skin says moisturizer is too heavy on hot summer days. Vitamin C Serum. It makes yet another appearance on this blog for a good reason. Another obsession of mine that will undoubtedly be a repurchased item (if I haven’t swayed you yet, Julia Restoin-Roitfeld uses it…). I neither know nor will pretend to understand the science portion of how it works (hence why I’m a journalism major), but will tell you this: miracle in a bottle for beautiful skin. 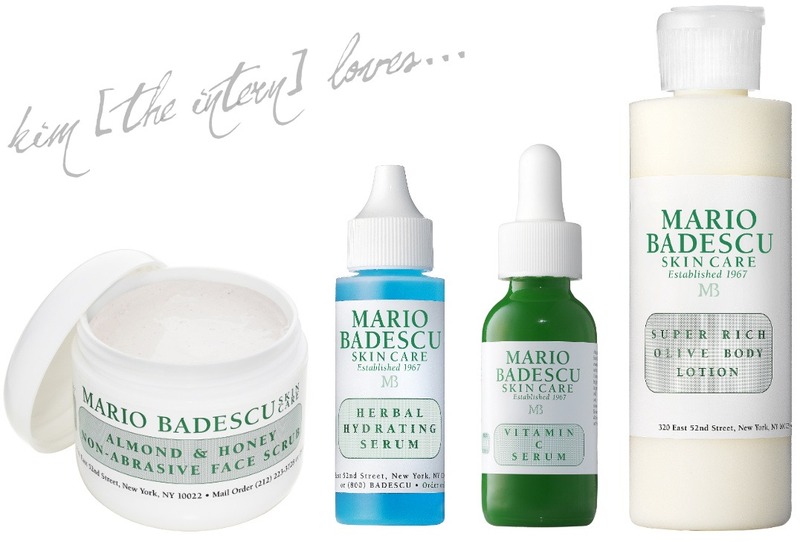 On the pricier end of Mario Badescu products, but it’s worth the investment. Trust me. Super Rich Olive Body Lotion. Don’t let the name deter you from the lotion – it’s rich without a doubt, but nothing close to greasy. Apparently it’s one of our most popular products – and as much as I despise being a groupie for that so-called “it” product, it’s well-loved because it’s good. I have quite dry skin and have long been on the hunt for something deeply moisturizing, but also absorbs quickly so I could get dressed minutes later and head out the door without leaving lotion-residue on everything I come in contact with. It does exactly that. Period. What are your holy grail products? Let me know (I’ve developed a new-found thirst for all things skincare) & leave it in the comments below! Holy grail products? Probably Drying Lotion, Healing Cream, Silver Powder, and Oil-Free Moisturizer with SPF 17. The Drying Lotion makes whiteheads just disappear. See a whitehead? Dab on a little pink stuff before you go to bed, feel the burn, and when you wake up in the morning, the little goober is gone. I use the Healing Cream on pretty much all of my breakout areas, and it keeps the red down to a minimum. Quickens the healing process too. Silver Powder, I’m pretty sure, is a gift from the gods. For people with blackheads, this is a must have. It leaves the skin feeling sooo much smoother, and visibly less-clogged pores. The Oil-Free Moisturizer is perfect for South Florida, where I live, because that hint of SPF keeps the sun from doing too much damage, and the this formula is nice and light and doesn’t feel like it’s greasing up your face. The Oil Free Moisturizer doesn’t do anything ridiculous or astounding; it just does its job, and does it well. @Claire: We love how much you love MB (!!). Thanks so much!! Vitamin C Serums are my favorite! Nothing makes my skin glow like serums rich in vitamin C. A must-have!